I was surprised to find out that eBay is big business in Italy. The Italian version of the famous auction website — eBay.it, has caught my interest ever since. Just had to jump the language barrier, for which I have written this little how to. 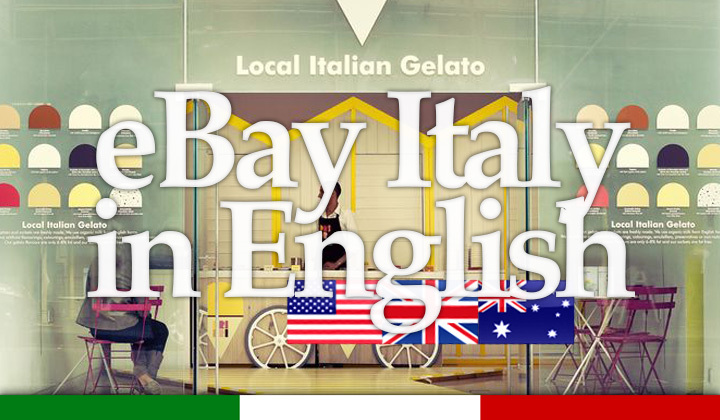 Now in 2019, access eBay Italy in English! Tip! Not all products can be sent internationally on the Italian eBay.it auctions, seller portal. Please, click here for delivery outside of Italy on international eBay store. Directly using eBay.it is a piece of cake. I would strongly recommend browsing to the website with Google Chrome and have all the pages translated completely automatically. There is no need for additional browser extensions, instead it just pops up to ask if you want pages in a foreign language translated. With not much alternatives, eBay has come to Italy to stay. Known for selling whole Italian villages, as well as 150 cars from government officials as a cost-cutting operation. Besides that, you have a highly price competitive and product abundant fleet of Italian sellers tempting your wallet. Without a doubt, they have become one of the biggest e-commerce websites in the country. Some say, that eBay.it would be even more popular, than the online shopping site Amazon.it — it’s biggest competitor. I’m guessing there is just something about auctions and bidding that fits the Italian mentality. Leaving this restless population to look for opportunities of all kinds. Millionaires are common in this part of the internet business world. Hope this helps & I’ll add on any information I might find out later on. Cheers. PS. Questions and comments are most welcome! I have my account with eBay but in Italia version but would love to have it in English version. Have you tried Google Chrome which is the easiest way to live translate eBay.it? There were some parts that needed copy/pasting to translate to English but other than that this worked great for me so cheers for the help. SA. With Chrome auto translation, one can read all wordings in English. Hope posting items in English to sell in Italy can also be automatically translated into Italian for Italians :/ So as of now, in order to sell anything in this country, foreigners have to learn how to write in Italian first! I opened an account and started to post a piece of furniture I want to sell. Then I couldn’t find the photos so I clicked on “Save for later.” The next thing I knew I received an email from eBay.it saying my account was blocked, cancelled, and I could never open another account under any circumstances. WTF did I do wrong???? Hi, can I send parcels from Italy(VERONA) to Australia(Melbourne)??? And if so have you got a price list.